Stalking--characterized by harassment, repeated calling, sending inappropriate letters or gifts, unsuitable use of social media, confrontation, and other unwanted behaviorsis a worldwide problem that is on the rise, especially the incidence and prevalence of cyberstalking. 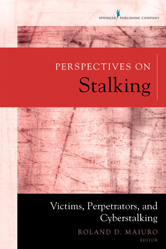 This book presents a collection of prominent articles published in the peer-reviewed journal Violence and Victims, written by experts on stalking from a variety of social science disciplines. Authors present research related to stalking victims and perpetrators, cyberstalking, how to identify stalking, and stalking in a variety of settings with a focus on college campuses.